LOS ANGELES, CA--(Marketwired - Sep 27, 2017) - Blaze Fast-Fire'd Pizza celebrates unconventional thinking on October 4 by hosting "Noncon4mist Day," a national pop-up pizza party for all who blaze new trails. The company, which encourages individual expression, will offer any pizza for $4 after 4pm at the more than 200 locations across the country. 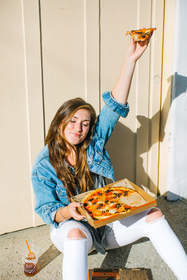 Blaze Pizza guests can build their own pizza by choosing from over 40 pizza toppings, all of which are free of artificial colors, flavors and preservatives. "Blaze Pizza was founded not only to serve insanely great food, but also as a place where people can come together to share ideas," said Kim Freer, Blaze Pizza's Director of Cultivating Fanatics. "We hope this unconventional pizza party sparks creativity and connection with others. At Blaze, we believe in doing things differently and want you to be yourself." Along with $4 pizzas, guests who attend Noncon4mist Day will also be provided with a bounce back coupon to receive $4 off a pizza and drink during their next visit, redeemable through the Blaze Pizza mobile app. All U.S. Blaze Pizza locations will be participating, except restaurants in stadiums, airports, at George Mason University and Disney Springs. The Noncon4mist Day offer is not valid in Canada. The first Blaze Pizza® restaurant opened on Aug. 6, 2012, in Irvine, Calif., and quickly gained attention for its chef-driven recipes, thoughtful interior design, and a service culture that celebrates individuality. Recently named '#1 Brand of the Year' in the 2017 Fast Casual Top 100, the fast-growing chain currently operates over 200 restaurants in 36 states and Canada, including the major metropolitan areas of Los Angeles, New York, Chicago, San Francisco, Dallas, Las Vegas, Boston, and Toronto. Founded by Elise and Rick Wetzel (co-founder of Wetzel's Pretzels), the concept is backed by private equity firm Brentwood Associates and founding investors that include LeBron James, Maria Shriver, movie producer John Davis and Boston Red Sox co-owner Tom Werner. For more information, visit www.blazepizza.com or www.facebook.com/blazepizza or click here to view a company video.